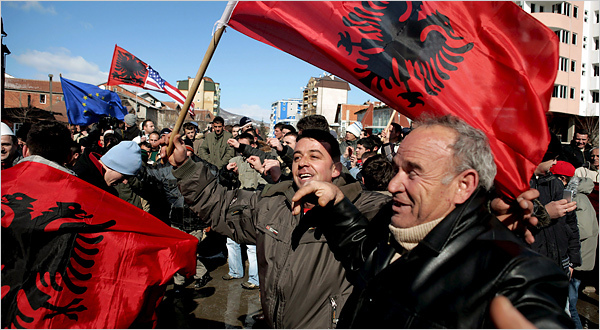 The crisis in Kosovo found many progressives concerned about the plight of the ethnic Albanians yet distrustful of NATO intervention. A major difficulty for most Americans is our lack of familiarity with the history of the former Yugoslavia. Most people were largely unaware of events there until the beginning of NATO military action. This site presents a number of first-hand reports, histories, commentaries, and links to other information sources. We sincerely hope that this first-hand perspective will give us the information we need to understand events in Kosovo in their historical context. We hope that these observations will provide a glimpse behind the headlines into the heart of the Kosovo conflict. Our present focus is on countering the disinformation being spread in support of enduring Serbian denial of war crimes. This denial is propagated not only within Serbia but outside as well. See War-crimes Deniers. Milosevic's old allies celebrate his "innocence"
Disputed claims that the Hague Tribunal said that Milosevic was innocent are being trumpeted by Serbian ministers and other propagandists trying to whitewash the country's wartime past. Ethnic Albanians celebrate Kosovo’s declaration of independence. convinced the group to withdraw a speaking invitation to Parenti.